Congrats, you’re headed to Super Bowl LI in Houston! Now, for that pesky ‘packing’ thing that comes along with every vacation. Don’t worry, we’ve got you covered. 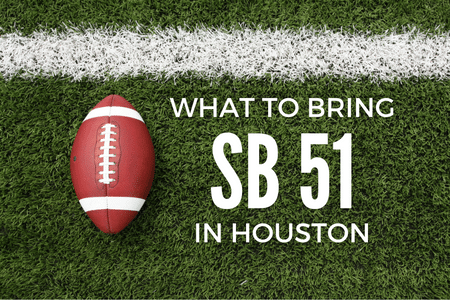 Here’s a comprehensive list of some of the things you should expect to pack for your trip to Houston for Super Bowl weekend! Unless you’re going to the Super Bowl just to see Lady Gaga perform, you’re going to need your gear. Whether you’re a face-painting, shirtless, hair-dyed superfan, or just an everyday, jersey-sporting American, there is no better place to represent your team that at Super Bowl weekend. Make sure when you’re packing, that your squad is properly represented. Even if they’re not in the Super Bowl, or haven’t been for years (we’re looking at you, Cleveland Brown fans). They’re your squad. Your city. You have to represent. Of course, you need tickets. Don’t try to show up without them, take it from us. Bullseye’s Super Bowl LI Travel Packages don’t just come with a ticket to the game, but a whole weekend experience! With some of the most luxurious hotels in Houston, and a ticket to the pre-game 2017 Players Tailgate with Guy Fieri, it’s sure to be a great time. Secure your tickets. Head for Super Bowl LI! Don’t Be A “Phony.” Keep Your Phone Juiced! Granted, you don’t go anywhere without your phone. Neither do we. But you have to be prepared! Between the Players Tailgate, Guy Fieri whipping up the menu, and Super Bowl weekend being the most star-studded weekend in sports, it’s almost a given that you’re going to run into actors, celebrities, players and some of your favorite sports personalities. That’s why not only should you bring your phone, but bring a back-up battery or portable charger as well. Nobody’s going to believe you met Vince Vaughn at your hotel if you don’t have a selfie with him, right? The NFL has strict “Clear Plastic Bag” rules to help protect fans and ensure the safety of Super Bowl LI at NRG Stadium. There are certain things you can’t bring into the game, and none of it can be in big, bulky bags or fanny-packs. Items such as alcohol, fireworks, beach balls and noisemakers are not allowed in the stadium. For more information on what is/isn’t allowed inside of NFL Stadiums and what type of bag you may bring in, click here.